Being one of the best German Holiday destinations, Heidelberg is situated in the Neckar river valley. Since Heidelberg has the best university of Germany, Ruprecht-Karls-Universität or Ruperto Carola, the place all through the year attracts number of scholars and students from all over the world. The beauty of its old town, perfect cozy ambience of its pubs and the youthful air of Heidelberg makes it a very mesmerizing vacation spot. Hotels in Heidelberg can be found in plenty ranging from luxury hotels to economical ones. Throughout Heidelberg, the hospitality of its hotels is excellent. As a travel destination, Heidelberg is full of exciting places to visit. Some of the best picks have been mentioned below for your convenience. On the door of the half-ruined castle of Heidelberg hangs an iron ring. Going by the myths, anyone who bites through the ring has the right to claim the castle. This castle is the best architectural magnificence of Heidelberg. To find more about the history of the Heidelberg castle it is suggested that you buy castle travel guide that is readily available at the ticket office. Or if you simply want to savor the stupefying views around then you may leave out the handbook. Although entering the castle gardens is for free, there is an entrance ticket for the Castle courtyard. Being a small town, every nook and corner of Altstadt is within one’s reach. To begin with, you may start off from Bismarckplatz to reach Hauptstrasse- also called the high street- on foot. On the High Street you can have a ball of time by shopping along the arcades and relaxing at many roadside kiosks purveying sumptuous snacks and coffee. To make things easier, you can even arrange for a day tour with the Heidelberg Tourist Office that will help you travel around the place for about 2 hours. Next to the Old Town is River Neckar. In this area you will find a fleet of passenger ship docked on the river. Leasing one of the ships for a 3 hour joyride around the Neckar Valley is the best and the most ideal way to explore this idyllic spot. While cruising around the place you no doubt marvel at the exquisiteness of the quaint villages about River Neckar. Or if you are an audacious adventurer, then renting a bike would definitely make your soul happy. For bike hiring services you may contact PerBike, Bergheimer Strasse 125. Pedaling is another funky way to explore Heidelberg. Special cycle paths have been designed for the cyclist. Therefore with more road space the views would be all the more interesting and beautiful. Accommodation, as mentioned earlier, is never a problem in Heidelberg. Hotels in Heidelberg come in all ranges. Well equipped with all basic facilities and services, Heidelberg Hotels offer every other service to meet all your needs and requirements whether you are on a business trip or on vacation tour. 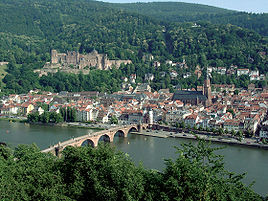 So visit Heidelberg City and witness its beauty by your own eyes to believe us.